Our Business Meetings are held every first Tuesday of the month at the Pendley Manor Hotel. Monthly informal social gatherings are held at local hostelries. 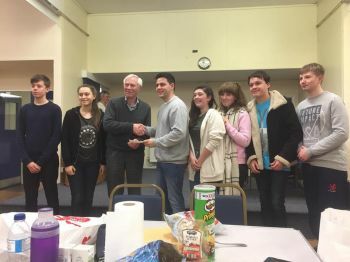 Tring Lions have had a busy December fund raising for the many good causes that they support. The people of Tring donated an amazing £1650 at our Christmas Eve Carol Concert. This will be divided between the local scouts group (who helped at the concert) and children's charities. Our Chocolate Father Christmas Raffle proved very popular and it raised £336. Our thanks to Graces, Beechwoods, Metcalfes, Dunsley Farm Shop, Meads Farm Shop, The Greyhound Aldbury, The Greyhound Wiggington and The Rose and Crown Ivinghoe for supporting the raffle. A sunny day at Tring Carnival. 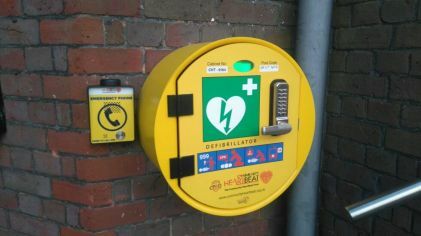 Tring Lions were collecting outside Tescos on Friday 16th Feb in aid of Scannappeal who are raising money to buy specialist equipment to help and restore vision for local people. Thanks to Tesco's and their customers we collected £392 which the Club will make up to £500. On Christmas Eve around 1000 people gathered in the Forge Car Park for the Lions annual Carol Concert, thanks to their generosity over £1500 was raised to support local good causes. 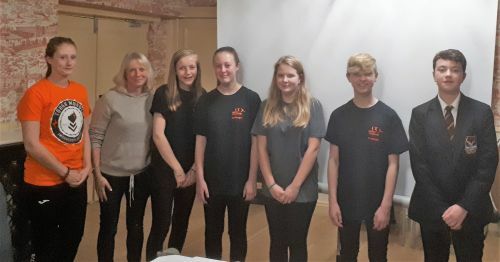 Representatives from Tring School recently attended one of our meetings and made a presentation on their World Challenge expedition to Belize in 2017 and their plans for Sri Lanka in 2018. In Belize the pupils helped build a shelter adjacent to a small community clinic, they will be involved in a similar project during their Sri Lanka expedition. 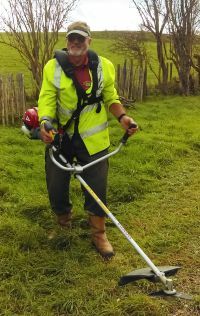 The Lions have offered their support for both projects. 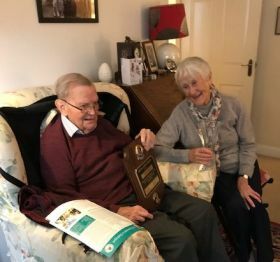 .
. To celebrate the Millennium, Tring Town Council created the 'Millenium Woodland' close to the Allotments in Duckmore Lane and Tring Lions sponsored the installation of a seat so that walkers could enjoy the view. Thanks to the dedication of Lion Derek the seat has recently been restored to its former glory. 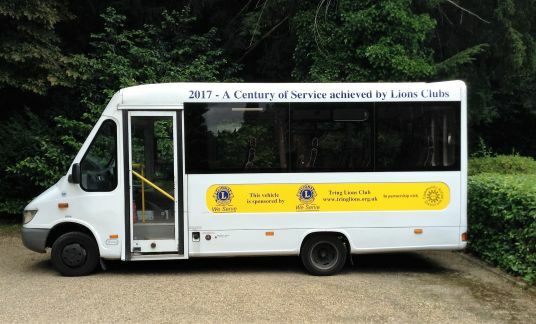 With nearly 1,500,000 members in over 200 countries Lions International are currently celebrating their 100th anniversary, to mark the occasion Tring Lions updated the wording on the Community Action Dacorum bus that they sponsor. Last year Tring celebrated the 700th anniversary of the granting of Town Charter status by King Edward II. To commemorate the occasion the Lions sponsored a book containing photos of all the events that marked the occasion. 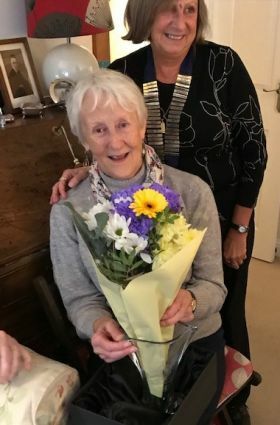 The book was compiled by Tring Together and copies of the book have been presented to Tring Town Council, the Library, Tring Together and last year’s Town Mayor, Stephen Hearn. All the local schools took an active part in the celebrations and yesterday copies of the book were also presented to them. 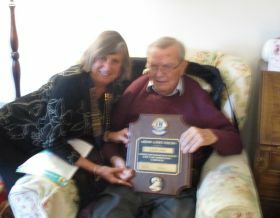 Tring Lions Club was established in 1973. Part of Lions Club International, a voluntary organisation of over 40000 Lions Clubs in over 200 countries. Total membership is over 1.4 million members including over 18,000 in the UK. 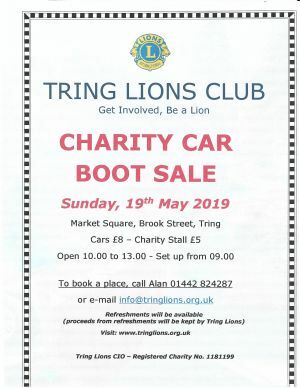 Tring Lions Club has 16 members.